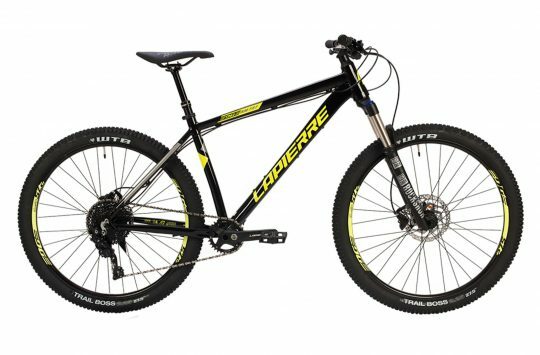 It’s your last chance to take advantage of our rather spiffing deal for our lovely Premier Users from Evans Cycles – a 20% discount on two great Lapierre mountain bikes, the 2010 Lapierre Zesty 214 and the Lapierre X-Control 310. The offer finishes on the 31st of May, so get a move on if you want to save a slice off a shiny new Lapierre. The Zesty is bang up to date in the looks department. Everything from the neat graphics to the sculpted rocker arm has a ‘right’ look and the Zesty wouldn’t look out of place coming from one of the big US brands. The four bar linkage gives up 140mm of travel via a swing link under the top tube. The link pivot is in a carefully placed position and doesn’t move with frame sizes. There are a lot of neat touches – like the CNC sag indicator on the seat-tube (why do other firms not do this?) and lots of light hearted graphics, like the full washing instructions on the BB shell. The 714 number indicates that it has 140mm of travel and is the second from top model, the numbers going 3,5,7 and 9. Continuing on the ‘neat touches’ front, there’s a little carbon sharkfin shielding the, already low profile, Shadow rear derailleur. I can see scratches on here being a source of pride in the future. What a fun bike! Just sitting behind those wide, oversize bars and surveying the whiteness of the bike, brakes and forks is enough to get you jonesing for a ride. And what a ride… The Zesty gives up its travel willingly, encouraging all sorts of ‘I’m a freerider, me’ moves that you wouldn’t think of on other bikes. The flared and oversize back end works so well at tracking the ground that I was confident enough to follow it through on a sideways drift rather than my usual ‘panic and brake’ or ‘panic and eject’ responses. Uphill it’s no slogger either, with barely a jiggle of movement from the shock, even with the bike set to ‘freeride’ amounts of sag. corners without a particular care about what’s round them. It’s best to view the Zesty as a slightly better riding buddy – one that’ll join you for every ride, matching your speed, but who will sometimes whisper ‘Why not try the harder line this time? Just follow me’. Even with the comedy dry-conditions tyres, the Zesty was a blast to ride and made every extra diversion on the way back home worthwhile. If we were to level any niggles, they’d only be small ones: A front facing seat clamp would be nice, and £2700 is a big lump of money. The Lapierre Zesty shows a level of up to date looks and performance that doesn’t mesh with how we normally view Continental bikes. Everything from the graphics to the performance is razor sharp. The performance is engaging and FUN rather than just being efficient. It weighs as little as similar carbon bikes, yet has an air of durability. The Lapierre X-Control is a markedly different frame platform from the FSR-style Zesty, Spicy and Froggy camp. In fact this suspension platform is only used by the 100mm X-Control and the 200mm downhill bike, which at least says something about its versatility. 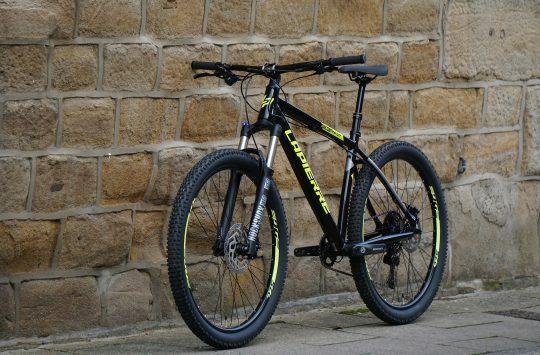 Lapierre are already well known for their stunning graphics and attention to detail, as well as a quirky sense of humour. A few riders mistook the ‘Fait Main’ (hand made) top tube sticker to say ‘Fat Man’ though… The same slick graphics feature on the X-Control as on other bikes in the range and there’s a super neat (and sharp!) sag-o-meter which makes setting the bike up a breeze. Just sit on it and if the arrow points to the shaded area, you’re good to go. The suspension features neat anodised nuts and everything has been colour coordinated with the components and the frame colours. Very neat. This extends even to the down-tube cable holders, though we were sad to see that the bottom downtube frame bosses was plonked right over Lapierre’s comedy ‘Washing Instructions’ laundry label. Perhaps fun isn’t as encouraged on such a racy machine. The riding position of the Lapierre is roomy but neutral. The angles (68.5°/72°) give it more of a trail-riding bike feel, though slap in a bigger fork and you’ll have a super-light trail bike on your hands. The action of the suspension is hard to perceive – although you’re getting full travel (we’d err a little on the lower pressure side if you like to get your money’s worth) it doesn’t feel like it’s using all the travel. It’s probably the most welcoming bike of the three to a hardtail rider. didn’t miss having lockout lever. A lockout on the fork would have been a little more useful, but again, not really essential. There’s negligible pedal feedback from the X-Control and that really helped the XC racer’s wish of being able to sit down and mash the pedals, whatever the terrain below. Whether irregular rooty holes or high frequency rocky buzz, the X-Control seemed to handle it fine. On twisty-turny trails, the front end could feel a little light, but that’s a common thing with all of the bikes here that you have to actively ride them, rather than just hop on and pedal. Pedaling is what the X-Control does very well though – very little pedal feedback and light wheels on a light bike mean that sat-down, flat-out pedaling is the rule here. The Lapierre was single-handedly responsible for breaking a couple of the Singletrack staff because there’s no ‘ease-off’ control. Hills were climbed, descents bombed and more hills climbed again until virtual blackout was achieved. Despite ‘only’ having 100mm of travel front and rear, the X-Control feels very capable and didn’t seem to get out of its depth on bigger terrain. The suspension travel is from the subtle school and it was only a glance at the shock O-ring that gave any indication of how hard the bike was working. It’s not super-light, but is still light, though it’s not cheap. What it does is give a fast and reliable ride without doing anything too extreme. It seems to lack the ‘fun’ ride and feel of the four bar Zesty and Spicy bikes and the weight of the X-Control isn’t far off its longer travel cousins. 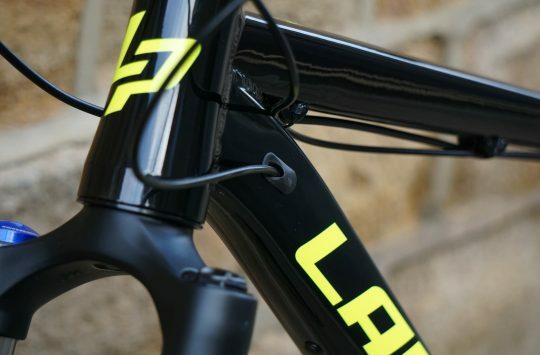 It’s a great bike, but falls too much into the ‘neither here nor there’ ground where there are better race bikes out there and more versatile trail bikes (even within the Lapierre range).